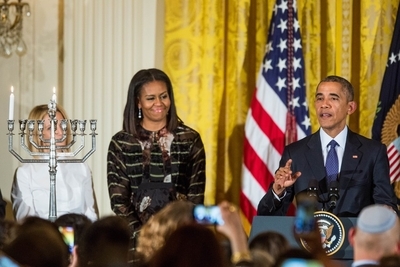 Is Obama's Hanukkah Gift a Palestinian State? The passing of United Nations Security Council (UNSC) Resolution #2334 marks an abrupt and significant change in decades of American policy toward the Palestinian-Israeli peace process. For decades the U.S. has worked to keep the Arab-Israeli issue outside the remarkably biased world body. That includes the U.S. veto of a nearly identical UNSC resolution in 2011 dealing with Israeli settlements or construction where UN Ambassador Susan Rice said that the decision should be measured on the standard of whether it would advance or impede peace. She warned: "Unfortunately, this draft resolution risks hardening the positions of both sides. It could encourage the parties to stay out of negotiations and, if and when they did resume, to return to the Security Council whenever they reach an impasse." Indeed, the very idea that the Security Council would be used as a Palestinian crutch in peace efforts was enough for the Obama administration to exercise its veto. For all of the doom-and-gloom scenarios analysts are now considering as they come to terms with this new reality, one scenario has not been sufficiently explored: What if it wasn't designed as a last minute slap against Israeli Prime Minister Benjamin Netanyahu? What if it is part of a plan to not only reshape the fundamental contours of a peace agreement but to create a de facto Palestinian state? An examination of his works through two terms in office with an eye towards Mr. Obama's quest for presidential legacies makes a compelling case that more fateful decisions lie in wait in the waning weeks of his presidency. Barrack Obama came into office hoping to be a transformational president. Until the recent U.S. election he had both a domestic and foreign policy legacy that he hoped to cement with Hillary Clinton's victory over Donald Trump in the November sweepstakes. Both the Affordable Care Act (a.k.a. Obamacare) and the Joint Comprehensive Plan of Action (a.k.a. the nuclear deal with Iran) demonstrated his propensity to swing for the fences and make a big splash. In both cases, gaining the votes of the opposition or the majority of the American people was of secondary importance, even if the optics of the debate mattered. Nevertheless, once the president made up his mind, he pressed on undeterred to the finish line. He had the help of Democrats along the way. Recall Nancy Pelosi saying, "But we have to pass the [health care] bill so that you can find out what's in it...." So Obamacare passed through Congress without a single Republican vote. In the case of the Iran deal, Mr. Obama managed to bypass Congress and the American people—where a bipartisan majority stood against the deal (polls: CNN/ORC, Pew Research, Quinnipiac University, and NBC/Wall Street Journal). With the help of enough Democrats, he was able stifle domestic debate and solidify the consequences at the United Nations. Jeffrey Goldberg of The Atlantic recalled in an interview with President Obama that when it came to defining decisions, "the president believes he finally broke with what he calls, derisively, the 'Washington playbook.'" These instances indicate his desire to buck the system and take bold action when he is steadfast in his beliefs on any given issue. Arguably, allowing the recent UNSC resolution to pass marks one of the more seismic shifts in foreign policy during his term in office. It not only breaks with decades of the "Washington playbook" but it contradicts his own stated policy from 2011. Since 1967, U.S. policy held that the only pathway to peace is through direct negotiations between Israel and its Arab adversaries. The UNSC resolution supersedes all other frames of reference for making peace, be they previous Security Council resolutions such as #242 from 1967 that served as the basis for Middle East peace, or the Oslo Accords of the 1990s that paved the way for the establishment of a Palestinian Authority, or the exchange of assurances between U.S. and Israeli leaders throughout different administrations and government configurations. 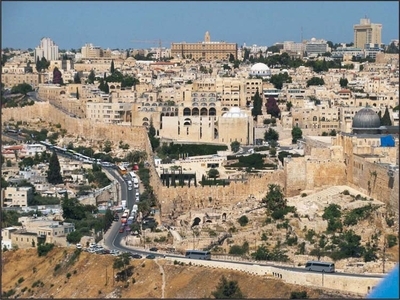 Jewish Quarter, Old City, Jerusalem, Israel, facing toward West Jerusalem. Instead, Barack Obama has taken a maximalist Palestinian position and created a new basis for negotiations in the future where the bulk of Palestinian demands are already met at the expense of the Israelis. Accordingly, the resolution means that Jews living in the Jewish Quarter of the Old City are now illegal outlaws and building and restoring their homes or synagogues that were destroyed under Jordan's 1948-1967 occupation is forbidden. It denies the rights of Jews to live and pray legally at the holiest sites in Jerusalem, including the Western Wall, despite more than 2,000 years of continuous Jewish presence in the Holy Land. And there is no distinction between the Jewish presence in Jerusalem or an isolated hilltop near the Jordan River. In practical terms, the UN resolution gives a tremendous boost to the Boycott, Divestment, and Sanction (BDS) movement that seeks to delegitimize Israel as a state and prevents Palestinians from grappling with their mythology—such as the idea that five million decedents of Palestinian refugees will one day return Israel while the West bank and Gaza will become a judenrein Palestinian state. In real terms, as the Obama administration recognized in 2011, the resolution makes peace less likely, not more. It's hard to overstate just how abhorrent the resolution is, not just to Israelis but Jews worldwide. Their connection to the land and Jerusalem in particular is not a modern day invention intended for political expediency. Nor has their exile changed the fact that the land has remained at the center of Jewish consciousness. The irony is not lost on Jews that the resolution passed just hours before the start of Hanukkah. The holiday celebrates the restoration of the Jewish Temple in Jerusalem by the Maccabees or Hasmoneans who liberated it from the Syrian emperor that set out to destroy Judaism in 167 B.C.E. The idea that the United States now considers that to be occupied Palestinian land should be an affront to those in a country built upon Judeo-Christian values. Will Israelis who come to visit Europe from Ma'ale Adumim or Jerusalem's Old City be subject to arrest and prosecution? Will all products made in the West Bank or Gaza by any combinations of Jews and Arabs now require special labeling and tariffs? Are 500,000 or so Israelis now subject to prosecution at the International Criminal Court? Is there a basis for the continuation of the Palestinian Authority as a governing entity? These are all open questions; we are in uncharted waters. Much has been written elsewhere about the icy relationship between the two leaders and the bevy of boisterous personal disputes. Obama came into office in 2009 and hoped he would have a more pliant, left wing Israeli government to work with. Instead, a few weeks later Netanyahu and his Likud-led coalition swept in and won re-election in January 2013 and again in March 2015. From Mr. Obama's perspective, he has been stuck with a stubborn, albeit democratically elected, Israeli prime minister who has the audacity to challenge him on issues of national security and the gall to accept the House Speaker's invitation to speak before a joint session of Congress and layout the pitfalls in the Iran deal. If only Netanyahu and voting Israelis understood that President Obama and his Secretary of State knew what Israelis needed more than they themselves did. As such, the deep divisions on the substance of the peace process were especially pronounced. Secretary of State John Kerry explained in Jerusalem in May 2013, "People in Israel aren't waking up every day and wondering if tomorrow there'll be peace, because there is a sense of security and a sense of accomplishment and a sense of prosperity." That is to say that in his view, Israel would be in a better position to negotiate if they were less secure and less accomplished. If that smacks of a huckster trying to peddle snake oil, that's because it is. Rather, Kerry called for a "strengthening" of Palestinian Authority President Mahmoud Abbas—who is currently serving in his twelfth year of a four-year term—labeling him "the one person who is most committed to nonviolence." That displays the idea that the U.S. should compensate for Palestinian shortcomings while degrading Israel's position. After eight years of missteps and fruitless White House efforts at the peace process, it appears the Obama administration is re-shaping the playing field. Is this just an act of presidential revenge? At first blush it appears so. It looks like Obama had been biding his time to take a final swing and now in his final weeks, when he has no more elections to win, no Hillary campaign to stump for, no need to consult Congress, and no feeling of accountability to the American people, he decided to strike. But what if there's more to it than that? What if the UN vote is part of a well-conceived plan and if the president seems crazy, he's crazy like a fox? After all, despite conventional wisdom that claims this is merely an act of vengeance on Obama's part, it is remarkably counter-intuitive and self-destructive. It isn't just bad for Israel; it is bad for future U.S. presidents whose hands he just tied, and it will prove bad for Palestinians as it reinforces the idea that they don't need to negotiate or compromise to gain statehood. It also encourages groups like Hamas and other terrorist groups who reject Israel's existence and makes fools of those who were willing to go the distance for peace. Take, for instance, the issue of Jerusalem. The president feels so strongly about the status of Jerusalem that when a September 30, 2016 statement went out that said Obama's remarks took place in "Jerusalem, Israel" the White House felt compelled to reissue the statement with "Israel" crossed out. Yet paradoxically, his UN gambit makes it far more likely that President-elect Trump will move the U.S. embassy from Tel Aviv to Jerusalem as a gift to Israel and message to the UN. It makes Democrats less likely to oppose the move. And it will likely embolden Netanyahu's coalition to build more settlements and expand in Jerusalem at a faster pace since they've already declared their intention not to follow the UN ruling. Netanyahu will be able to claim that the world is out to get Israel no matter what they do. More confounding is that his actions are bad for his own Democratic party, whose leaders scorched Obama over his swipe at Israel. At a time when Democrats are in disarray, trying to regroup and rebuild from a bruising election, he cast a bright light on one of their bigger divisions as a party: the divide between those who dislike Israel and those who don't. This, at a time when many rank and file Democrats believe that Rep. Keith Ellison of Minnesota represents a fresh face to lead the Democratic National Committee even though he's under scrutiny for past ties to the Nation of Islam and his defense of anti-Semitic figures. It presents terrible optics for Democrats at an exceedingly inopportune time. If President Obama did all of this because it personally felt good to grind his ax it would truly be remarkable. That wouldn't be presidential; it would be myopic, petulant, and childish. A more likely scenario is that this is a well thought out plan and his UN gambit isn't an endgame. Whereas he passed Obamacare without a single Republican vote, and then bypassed Congress and the American people to tie the country to his Iran deal, the precedent is set for him to ignore the American people and the very countries involved in a peace agreement and impose his vision of a two-state solution. That would mean that UNSC Resolution #2334 represents an opening salvo against Israel, rather than a parting shot. 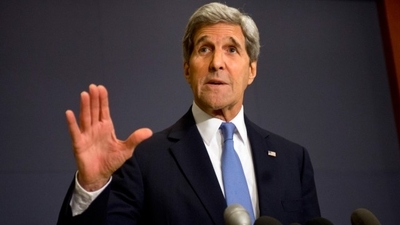 John Kerry is set to make a major address on the peace process in the coming days. He will likely layout comprehensive details of what the Obama administration finds acceptable in the elusive final status agreement between Palestinians and Israelis. Indeed, Obama's final solution to the Israeli question may yet be to take his ideas and bring them to the United Nations Security Council where an affirmative vote is all but guaranteed. The final gift of his presidency: a U.S.-recognized state of Palestine created by politicians inside Washington. And that is the kind of legacy a hungry president with such bold vision and a penchant for greatness could really sink his teeth into.